`Cyberspace' is the emerging invisible, intangible world of electronic information and processes stored at multiple interconnected sites. The digital revolution leads to `convergence' (of telecommunications, computer/Internet and broadcasting) and to dynamic multimedia value chains. Deregulation and competition are major driving forces in the new interactive electronic environment. 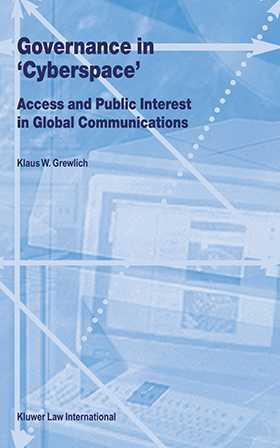 This volume contains normative proposals for `cyber'-regulation, including self-regulation, grounded on developments in the EU, US and the Far East, in international organisations (WTO, OECD, WIPO, ITU), in business fora, in NGOs, in the `Internet community' and in academic research. The multi-actor (government, business, civil society) and multi-level analysis (subsidiarity) pertains e.g. to ex-ante and ex-post access-regulation, competition, network economics (external effects, essential facilities), public interest principles (human dignity, free speech, privacy, security), development and culture, consumer protection, cryptography, domain names and copyright. Lawyers, regulators, business executives, investment bankers, diplomats, and civil society representatives need shared essentials of plurilateral `governance' to safeguard both competition and public interest objectives, at a scale congruent to `cyberspace', in the transition to an `international law of cooperation'.